Flat braid wick has a decorative appearance and is commonly used in dipped or molded self-supporting candles, such as tapers and pillars. This wick is designed to provide a slight bend when burned, which allows for an even burn and a reduction of carbon formation (mushroom) at the wick’s tip. A&P Flat Braid Ply Wicking is sold raw and unprimed. Choose from 100' size or a 1 pound spool. 24 ply approx. 1506 feet per pound, 30 ply approx. 1173 feet per pound, 36 ply approx. 975 feet per pound & 45 ply approx. 741 feet per pound. 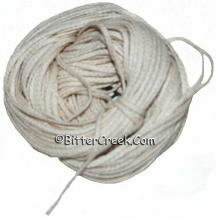 *A&P Ply Cotton Wicks are tested and sized based on use in a Straight Paraffin Wax with No Additives. Wicking is based on the WIDEST area diameter of the candle you plan to make. This is typically not measured at the opening unless the container is perfectly straight up and down. 24 Ply Small 2.5 - 3"
30 Ply Medium 3 - 3.5"
36 Ply Large 3 - 4"